Laporan hasil akhir konsolidasi tanah tahun 2014. Disasters in cities contain severe destruction of buildings and loss of access to land. Consequently, a post-disaster re-development plan may need to rely on different land consolidation approaches. An associated dilemma is to re-establish the built-up area in its original formal shape, or to innovate the urban design partially or completely. An important consideration in the allocation of new land and building rights is whether to restitute former rights or allocate new rights. Participation of former residents and firm owners alongside overcoming the immense social trauma are crucial elements of this process. The aim is to derive new land consolidation optimization criteria which could support urban post disaster land consolidation. The guiding hypothesis hereby is that consolidation of memory and identity are two important aspects which need to be incorporated in land consolidation design and implementation procedures in order to ensure ownership of the consolidation result and to help overcoming the social trauma. Land consolidation theory has primarily been rooted in agricultural economics and land management. The concept of optimization during the consolidation processes can however be critically questioned from the perspective of social disaster mitigation experiences. In this body of literature it is argued that the return to daily life after a disaster requires both a sufficient acknowledgement that humans tend to want to re-install historically known artefacts in order to be able to reintegrate into regular new social routines. This is summarized by the concepts of memory consolidation and preservation of identity. These concepts provide an analytical way to question contemporary urban land consolidation approaches. Two relatively recent specific cases were used to assess the degree to which elements of memory consolidation and identity preservation are incorporated in post disaster land consolidation: the firework disaster in Enschede, Netherlands in 2000, and the Merapi disaster in Yogjakarta, Indonesia in 2010. These cases were chosen because sufficient documentation has been collected, and it was still possible to acquire additional data from people who had experienced both the previous and post disaster situation. Both cases exhibited considerable attention for the simultaneous processes of reconstruction and participation in the land consolidation processes. Participation is often framed as a process which has to be stimulated during a technical land consolidation and reconstruction process. In some instances it is however an endogenous social process whereby citizens claim ownership of the process prior to the technical reconstruction. Especially in the resurrection of historical monuments and/-or in the delineation of areas with spatial significance in relation to the disasters. Where conventional consolidation approaches in rural areas tend to emphasize the need to optimize agricultural production or environmental protection, optimization indicators in post disaster consolidation need to be adapted. Especially procedures and tools to incorporate memory consolidation and identity preservation need to be incorporated. This can be done theoretically, but still requires further research and actual implementation experiences into how to consolidate that into current institutional procedures and operational software packages. In the past 15 years there have been an increasing number of urban disasters, the most prominent ones being the 2011 earthquake in Christchurch / New Zealand, 2011 earthquake and Tsunami affecting various urban centres in Japan, the 2010 earthquake affecting Port-au-Prince in Haiti and the 2004 south East Asian Tsunami affecting Banda Aceh amongst others. A disaster is ‘a sudden, calamitous event that seriously disrupts the functioning of a community or society and causes human, material, and economic or environmental losses’ (IFRC) . Besides the natural disasters there is also an increase in mand-made disasters, usually due to an increase in traditional hazards such as fires and explosions, or due to human conflicts, terrorism, war, human errors, irresponsible settlement or mismanagement in planning. Both natural and man-made disasters manifest themselves with loss of lives and usually severe loss of buildings. Sustainable reconstruction after disasters takes place when the immediate threat of the disaster event has disappeared. In this phase there is an urgent need to rehabilitate livelihoods, reconstruct buildings and infrastructure and (re-) allocate land and building rights. Here, spatial planners, land managers, architects and civil engineers play a crucial role. For both types of disaster a key characteristic of urban disasters is that they - besides the loss of lives and severe destruction of buildings - are accompanied a loss of access to land and real estate property. In the process of reconstruction, a post-disaster re-development plan may needs to rely on different land consolidation approaches. Not only may previous owners and occupants of land and buildings have died as a result of the disaster or do the buildings no longer exist (as a result of which reallocation of ownership may be necessary), also the entire infrastructure may prevent the immediate reconstruction of the area in exactly the same shape. A reconstruction dilemma is therefore to re-establish the built-up area in its original formal shape, or to innovate the urban design partially or completely. An important consideration in the allocation of new land and building rights is whether to restitute former rights or allocate new rights. Participation of former residents and firm owners alongside overcoming the immense social trauma are crucial elements of this process. In other words, land consolidation and reconstructing property should not only cater for the administrative process, but also take the social reconsolidation into account. This article takes a closer look at what this consist of, with a particular focus on reconsolidating historical social memory and preservation of identity. This is done using two well-documented cases of urban disasters: the firework disaster in Enschede/Netherlands in 2000 and the Merapi disaster in Yogyakarta / Indonesia 2010. In these cases the degree to which elements of memory consolidation and identity preservation are incorporated in post disaster land consolidation are assessed. The conventional association of the scope and utilization of land consolidation is with agricultural economics and rural development. FAO (2003) refer to land consolidation as Land consolidation can assist farmers to amalgamate their fragmented parcels. For example, a farmer who owns one hectare divided into five parcels may benefit from a consolidation scheme which results in a single parcel. In many eastern European (FAO, 2004) and African land consolidation programs tend to have primarily such an economic production (Musahara, Nyamulinda, Bizimana, & Niyonzima, 2014) and/or and rural development focus (Bullard, 2007). Musahara et al. (2014) describes this micro-economic agrcultural benefit in the cases of Rwanda, where the Land Use Consolidation (LUC) programme was initiated in 2008 as part of a broader Crop Intensification Programme in Rwanda launched earlier in 2007. More recently land consolidation is associated specifically to a societal benefit or public value, such as food security (Bennett, Yimer, & Lemmen, 2015) or environmental protection (Louwsma et al., 2014). Not the micro-economic agricultural production values count in these cases, but the public values at a larger – often national or regional - scale. The optimal output of a land consolidation process then needs to be evaluated in terms of this societal benefit, rather than a pure economic benefit. Method-wise, Louwsma and Lemmen (2015) introduce land consolidation as an instrument to counteract land fragmentation and the associated negative impact on the productivity and costs of farming. The most common interpretation of land fragmentation relates to physical aspects of fragmentation, i.e. holdings with a large number of small parcels scattered over a considerable area. (Savoiu, Lemmen, & Savoiu, 2015) indicate that different types of land consolidation exist which each require different methodologies of implementation and different indicators of optimization. Vitikainen (2004) specifies such indicators of land consolidation are (Vitikainen, 2004): defragmentation of parcel size and location (improvement of agricultural and/or forest land division, re-allotment of leasehold areas, enlargement of farm size), reconstruction of urban areas (land use planning in village areas, readjustment of building land), creation of accessibility to roads and utilities (improvement of road network, drainage network), environmental protection and planning (implementation of environment and nature conservation areas), spatial and regional development (promotion of regional development). Demetriou, See, and Stillwell (2013) further specify procedures and decision support systems to quantify the resultant optimization parcel sizes. Louwsma and Lemmen (2015) acknowledge that there are multiple socio-economic dimensions of fragmentation. Participation and embedding of economic, technical informational and infrastructural solutions in a societal context is considered of crucial importance (Louwsma, Van Beek, & Hoeve, 2014). Especially in urban disasters parcel fragmentation is however not the key problem when reconstructing and returning to daily life. Moreover, also the methods, processes and key indicators used on rural land consolidation do not seem to fit the objectives of urban land consolidation. Plot size, land value are not the primary elements, but rather public value, participation, resilience and public acceptance. Furthermore, in urban areas there is a different sense of neighborhood and spatial identity. Based on the above considerations, Figure 1 summarizes the land consolidation approaches and its optimization criteria relevant for the consolidation tools and instruments. The traditional land consolidation optimizes on economic productivity or collective micro-economic benefit. 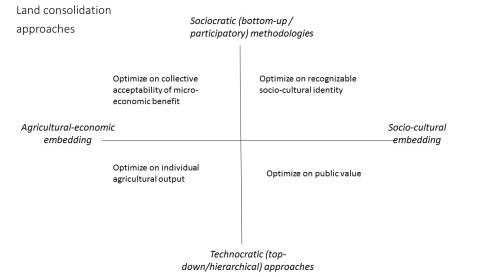 When emphasizing socio-cultural embedding, optimizing public values become more important. Real participation in all steps of a land consolidation process, including participating on which values are crucial for the stakeholders, optimize on criteria which are recognizable and identifiable by stakeholders. The analytical framework to evaluate this documentation relied on the conceptualization of post-disaster ’memory’ by Bevan (2006) and urban cultural identity by (Boom, 2009). Although Bevan (2006) primarily focuses on the deliberate (instead of accidental) destruction of cultural heritage during man-made disasters, such as war times and terrorists attack, implicitly he conceptualizes cultural memory from an extensive description of symbolic meanings which are manifested in specific buildings, locations and infrastructure. The Twin Towers attack on 11 September 2011 indeed destroyed 110 floors of two prominent buildings, but essentially the symbolic value of that physical destruction was related to a difference in historically grown and accepted cultural and societal values. Similarly, the 1993 destruction of Stari Most bridge in Mostar, Bosnia-Herzegovina during the Balkan war and the more recent destruction of world heritage site Hatra in Mosul, Iraq, in the contemporary war of Islamic State is primarily meant to destroy collective memory and spatial-physical anchor points of societal fabric. Both were symbols and meeting point of a multicultural and cosmopolitan society, with ethnically mixed marriages and religious diversity. The destruction of the physical artefacts was an immediate statement against such cultural values and identities. As cultural identity and collective memory depend on imitating and prolonging traditions on the one hand and physical recollection of the past or personal linkages from the present to the past, reconstructing artefacts with the aim to restore previously existing values needs to make both a physical and symbolic connection to the past. The simplest way is imitation of the past. Architectural building imitations rely on procedures and methods to re-erect the buildings and artefacts in the exactly the same shape as before. Many cities after the Second World War were reconstructed in this way. Although this did result in some degree of cultural memory reconstruction, it became also clear that the buildings lost value in authenticity, because they were no longer original and could no longer be identified with the building labour of the past (Denslagen & Gutschow, 2005). Instead of exact imitation which is primarily based on the physical artefacts, it is also possible to rely on the personal memories and values of the people involved. Monuments, for example, are one way to prolong the collective memory of people, rather than to bring back the buildings of the past. In line with this reasoning, land ownership imitations could be one way to complement the cultural memory reconstruction. This is where land consolidation touches memory consolidation. Symbolic land consolidation is then more related to common land artefacts which have some public significance, such as historical sites or parcels of land or buildings with significant value to local communities. Such values can often not be recognized by physical objects, but only be identified by extensive discussions with local representatives of both the past and the future. Two urban disaster cases were identified for this research, which were different in location, size, impact and origin of disaster. Similar was however that land consolidation took place, and that this process was relatively well documented. The 2000 firework disaster in a residential area, Roombeek in Enschede, in the east of the Netherlands near the German border on 13 May 2000. The blast had destroyed 400 homes and damaged 1500 buildings of the residential area. The documentation of this case is largely based on the documentation aggregated by the dedicated websites http://www.roombeek.nl, http://www.enschede-stad.nl/projecten.php?project=Roombeek , and the theses of de Groot (2005), Langereis (2014). The second case concerns the Merapi volcanic disaster in Yogyakarta / Indonesia which took place in October-November 2010. Over 350,000 people were evacuated from the affected area. The volcanic material from the eruption overflowed the river running through the province of Yogyakarta, inundating hundreds of houses along the riverbank. After the mudflow subsided, people returned to their homes, and reconstruction started, yet the area remains prone to the next disaster if not accompanied by proper planning and land management. Land consolidaiton is an important part of this. The data of this case are largely based on the documentation and reports of the provincial office of Yogyakarta of the Indonesian land agency BPN (BPN Provinsi Daerah Istimewa Yogyakarta, 2014). The reconstruction and consolidation of the Roombeek area employed new methods of spatial planning and management, allowed many architects to design individual houses and relied on new urban consolidation methods. In other words, the disaster also opened up new ways of reconstruction and reconsolidation. The boundary of area Roombeek in Enschede is closely related to recent history. Being originally an area of textile factories, the area consisted of a mix of working class houses, factory areas, small parks, middle class residential areas and estates of textile factory owners. This mix of land use and economic activity explains why it was possible that a firework storage resided in the area. However on the fatal day of the disaster 177 ton of firework exploded after a chain reaction of smaller explosions. It wiped out an area of 42,5 hectare (the approximate size of the Vatican city), affected 650 houses, 500 small sized enterprise buildings and 8 associations residing in buildings. A total of 23 people were killed, whilst approximately 950 people got injured. The reconstruction of the area was subcontracted to a specific project bureau ‘Projectbureau Wederopbouw Roombeek’ (PWR) under the supervision of the urban designer Pi de Bruijn. In addition to the new urban design, and information and advisory centre (IAC) was established with the aim to help victims cope with the traumatic experiences and support them with information needs and psychological help. Furthermore, a foundation city recuperation (SSE) was established to make an inventory of the damage to houses and property. Both IAC and SSE currently no longer exist, but they played a pivotal role in the reconstruction alongside the PWR. The reconstruction of houses and buildings formed a trend break in Dutch urban planning practices. Instead of subcontracting all housing to large real estate developers (thereby ignoring all possibilities of public participation), the project bureau deliberately opted for allowing private housing projects (in addition to the social housing). This allowed people to influence their own working and living environment with the support and supervision of professional experts. Parcels were individually re-allocated with a limited number of conditions. A total of 400 people opted for this possibility and each created their own style house, which promoted the variety. The industrial factory remnants were reconstructed into museums, art schools, studio spaces, small apartments and small office spaces. It maintained the look and feel of factories, be it that the usage has changed. This also implied a change of land and building ownership and use as compared to the previous status. Allocation and control of land ownership rights by title certification. The spatial plan for the next 20 years also included that it would not be allowed to live in a residential development area directly affected eruption Merapi 2010; that it would not be allowed to add new facilities and infrastructure in the affected areas Direct eruption 2010; and, that land utilization would only be allowed for special interest tourism, agriculture, plantation and reforestation in areas directly affected the eruption in 2010. One of the main reasons why it was possible to find support for these plans and execute the land consolidation without any major resistance was the presence of ‘gotong royong’ (mutual aid) among people in a certain community, which is an Indonesian tradition, rooted in Javanese culture, to support among others the reconstruction of each other’s houses. Both cases exhibited considerable attention for the simultaneous processes of reconstruction and participation in the land consolidation processes. Although participation is a word that is frequented mentioned in the documentation and success factors in both cases, it is often framed as a process which has to be stimulated during a technical land consolidation and reconstruction process. It is a passive participation, whereby – perhaps formulated a bit black and white, but to make the point clear - stakeholders either need to be convinced of their possible benefits of the land consolidation, or stakeholders become gradually informed of their benefits and rights. The economic perspective of land consolidation tends to be on the forefront, either in the form of agricultural productivity or in the form of economic potential of small businesses. The participation is than considered a dependent factor of economic optimization rather than the opposite. At the same time there is however also evidence that the participation is an endogenous social process whereby citizens claim ownership of the process prior to the technical reconstruction. Especially in the resurrection of historical monuments and/-or in the delineation of areas with spatial significance in relation to the disasters. This refers to the symbolic consolidation alongside the physical consolidation. In fact, memory is preserved and optimized rather than economic value. A second issue which comes back in both cases is the explicitly defined objectives to seek long-term security. This security is however mainly formulated as a perception of security. Feeling comfortable and feeling security are passive characteristics of such a perception. After reconstruction these perceptions should be fostered and optimized. More actively, reconstruction and land consolidation focuses on building attractiveness. This may seem a vague concept, but it is literally formulated in both cases as a planning principle. Apparently, attractiveness is a societal value which can be used as a concept to bridge shared perceptions to hard planning aims. This type of optimization indicator is one that often does not appear in most land consolidation reports or essays. Finally, for the specific urban context of the Roombeek cultural historical, architectural and urban design value (in addition to economic value) is considered important. This requires an insight into the industrial and constructive elements of buildings, knowledge and experience with light, usage of visual elements, spatial perception, functionality of buildings and public spatial element, and the psychology of the environment. This finding relates both to a cultural value and a professional value. Such values may not be very explicit, yet they are recognizable in so-called epistemic communities, i.e. communities who shared among each other similar values, rules and traditions. Consolidating epistemic values often does not occur by hard rules, rather by soft rules or isomorphic behavior. Yet, adhering to such values and acknowledging such values is crucial for the acceptance of the technical land consolidation solution. Where conventional consolidation approaches in rural areas tend to emphasize the need to optimize agricultural production or environmental protection, optimization indicators in post disaster consolidation need to be adapted. The main reason is that post-disaster consolidation also needs to take into account how to cope with the social trauma. The societal context and the social values existing prior and after the disaster are thereby critical. Socio-cultural embedding, optimizing public values as well as active participation in all steps of a land consolidation process, prior, during and after the land consolidation process are decisive. Consolidation of memory and identity needs to be enacted alongside realizing the micro economic benefits (of either agriculture, small-medium businesses or real estate). This requires that procedures and tools to incorporate memory consolidation and identity preservation need to be incorporated in both hard legal and technical instruments and soft methods and tools. This can be done theoretically, but still requires further research and actual implementation experiences into how to consolidate that into current institutional procedures and operational software packages. Bennett, R. M., Yimer, F. A., & Lemmen, C. 2015. Toward Fit-for-Purpose Land Consolidation, Advances in Responsible Land Administration: 163-182: CRC Press. Bevan, R. 2006. The destruction of memory: Architecture at war: Reaktion books. Boom, S. J. 2009. Roombeek. De vernietiging van cultureel geheugen en de wederopbouw van culturele identiteit (In English: The destruction of cultural memory and reconstruction of cultural identity). Universiteit Utrecht. BPN Provinsi Daerah Istimewa Yogyakarta. 2014. Laporan hasil akhir konsolidasi tanah tahun 2014. : 396: Badan Pertanahan Nasional Republik Indonesia. Bullard, R. 2007. Land Consolidation and Rural Development. Papers in Land Management. No. 10: 149.
de Groot, F. 2005. Integrale aanpak-Wederopbouw Roombeek: Erasmus University. Demetriou, D., See, L., & Stillwell, J. 2013. A parcel shape index for use in land consolidation planning. Transactions in GIS, 17(6): 861-882. Denslagen, W. F., & Gutschow, N. 2005. Architectural imitations: reproductions and pastiches in East and West: Shaker Publishing. FAO. 2003. The design of land consolidation pilot projects in Central and Eastern Europe. In FAO (Ed. ): 55. FAO. 2004. Operations manual for land consolidation pilot projects in Central and Eastern Europe: 69. Rome: Food and agiculture organization of the United Nations (FAO). Langereis, M. 2014. Herontwikkeling van industrieel erfgoed: vervallen monumenten als aanjager voor vernieuwing. Onderzoek naar bestuursstijlen van de gemeenten Enschede en Deventer. Louwsma, M., & Lemmen, C. 2015. Relevance of leased land in land consolidation, FIG Working week - From wisdom of the ages to the challenges of the modern world: 15. Sofia, Bulgaria. Louwsma, M., Van Beek, M., & Hoeve, B. 2014. A new approach: Participatory Land Consolidation 10. XXV FIG Congress, 16-21 June 2014, Kuala Lumpur, Malaysia. FIG, 2014. .
Musahara, H., Nyamulinda, B., Bizimana, C., & Niyonzima, T. 2014. Land use consolidation and poverty reduction in Rwanda, 2014 World Bank Conference on Land and poverty: 28. Washington DC. Prof. dr. ir Walter Timo de Vries, wt.de-vries@tum.de, is chair land management at the faculty of civil, geo and environmental engineering at the Technical University Munich. His research interests include smart and responsible land management, public sector cooperation with geoICT and capacity development for land policy. Key themes in his most recent publications advances in responsible land administration, mergers of cadastres and land registers, capacity assessment methodologies for land policy and neocadastres.